Adopt-A-Pet.com News < Win in DogVacay Giveaway! DogVacay Giveaway! 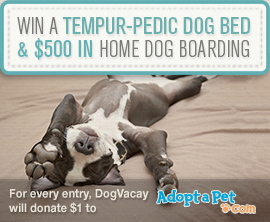 Win $500 in Pet Care and a Tempur-Pedic Dog Bed (While Helping Homeless Pets). Ask any pet owner and they will tell you that finding care for their four-legged children while they’re traveling is no easy task. They want the safety and security of professional pet care, but they also want their furry family members to get adequate one-on-one attention and not just be one of the crowd. That’s why Aaron Hirschhorn started DogVacay.com, an online service that allows pet parents to board their dogs in the home of pre-screened and insured dog lovers instead of a kennel. We recently chatted with Aaron to learn more about DogVacay and the work they do and we found that we have a common interest and concern – shelter pets! Aaron and his team have a soft spot in their hearts for homeless pets (with some DogVacay team members even fostering multiple at a time!) and wanted to know more about what they can do to help Adopt-a-Pet.com’s cause. That’s when his team had an idea for a giveaway that would not only help shelter pets, but also give a lucky winner the chance to experience the peace of mind of DogVacay’s home dog boarding services firsthand – and even score an awesome Tempur-Pedic dog bed for Fido! For the month of March, Adopt-a-Pet.com and DogVacay.com are partnering to bring you the chance to win $500 worth of home dog boarding and a top-of-the-line memory foam dog bed, both courtesy of the awesome folks at DogVacay! For each contest entry, $1 will be donated to Adopt-a-Pet.com – up to $10,000! You can enter the giveaway on DogVacay’s Facebook page and you can learn more about their services at www.dogvacay.com.